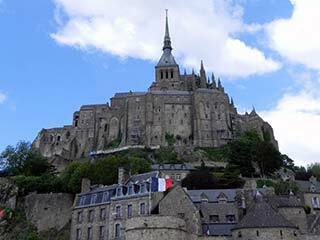 Let us plan your private overnight Normandy D Day tour from Paris to explore D Day sites of World War II and Mont Saint Michel. Your private Normandy D Day tour will take you to the many highlights of the Battle of Normandy and the tour will begin with a Paris hotel or apartment pickup by your driver guide. This Normandy D Day tour can be arranged for you throughout the year. The itinerary for your Normandy tour is flexible, but this is our suggested itinerary (if you wish a Canadian D Day tour focus, we can arrange to visit Juno Beach and other Canadian places of interest). Depending on what you and the guide decide, you might do the D-Day touring on the first day and visit Mt. St. Michel on the second day or you might do that in reverse. Some guests can extend their Normandy stay for longer, so let us know what you’re considering. We’ll happily book the hotel accommodations for you for this tour. We’ve also done customized itineraries that visit Normandy for a day or two before heading on for a Mt. St. Michel visit, and then ending the touring time with a day or longer to see the Renaissance castle of the Loire Valley. We will arrange whatever you wish to do! Your private guide will pick you up at your Paris accommodations at 7:30 AM. It’s a 2-3 hour drive North to Normandy and a very pleasant drive it is. The Seine River meanders through the countryside and the landscape is dotted with spires from little villages and sturdy Normandy cows (a breed brought by the Vikings in the 9th and 10th centuries. The itinerary is flexible. However, it might have the first stop at Pointe du Hoc, where members of the United States 2nd Ranger Battalion scaled the cliffs to attack a German gun battery. Operation Overlord (the Allied Invasion is Operation Overlord) had strategic areas to secure along the Normandy coast. 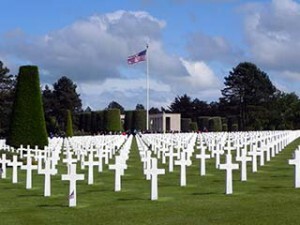 Your private D Day tour will continue to Colleville-sur-Mer to stop at the American Cemetery that overlooks Omaha Beach. You will want to take time to explore the Visitors Center and the Cemetery. You might want to walk down the path from the American Cemetery to Omaha Beach, since you definitely get a feel for what the soldiers must have faced looking back up the hillside. Your guide can also drive you along the beach road. Many guests want to experience a walk on Omaha Beach to truly soak up the feeling of that invasion and what it must have been like on June 6, 1944 at dawn. We want you to visit the German artillery battery at Longue-sur-Mer and also Arromanches to see the remains of Churchill’s Mulberry Harbor at Gold Beach. Your overnight will be in Bayeux and while in Bayeux, you should not miss seeing the Bayeux Tapestry. After breakfast, your guide will pick you up at 9:00 to leave for Mont Saint Michel where you will tour the abbey and walk Mont Saint Michel’s ramparts. 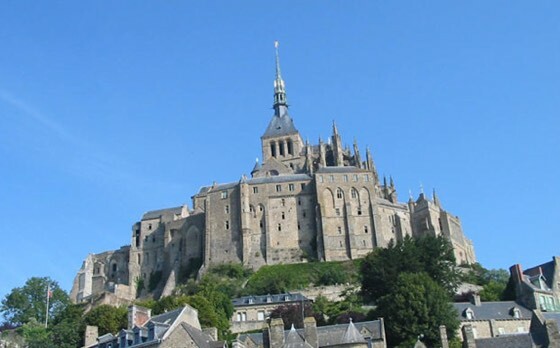 The abbey of Mont Saint Michel is unlike any other monastery. The Mount is in the shape of a pyramid, so it was necessary for the medieval builders to wrap the buildings around the granite rock. Amazing as well is that the construction not only was constrained by the topography and geography of the location, but by the requirements of monastic life. The resulting wonder conformed to both! You’ll return to Paris in the early evening. This private Normandy overnight tour could include more than two days, so let us know what you’re considering. We’ll happily book the hotel accommodations for you for this tour. Please use the form on the left to learn more about this Normandy Private Overnight Tour.